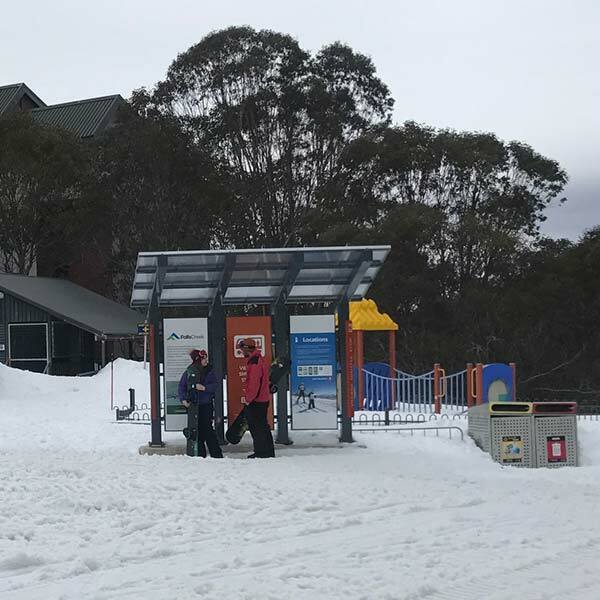 Visitor infrastructure in alpine areas needs to cater for both summer and winter users. 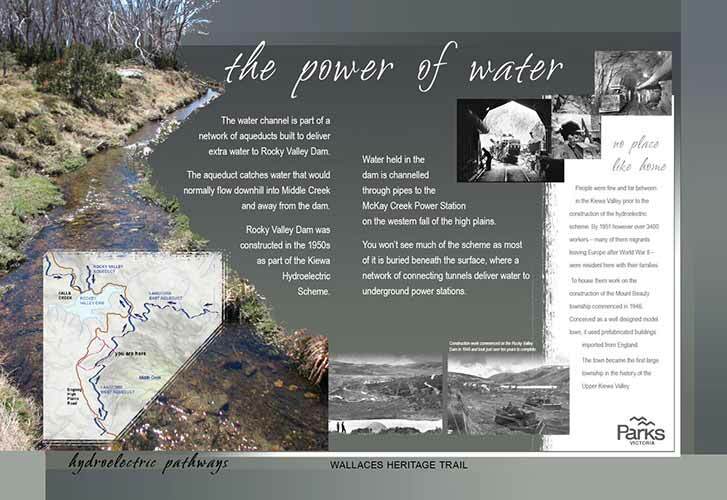 Nature Tourism Services have extensive experience in the Victorian high country delivering integrated visitor orientation planning and design solutions for the Bogong High Plains and the adjacent Falls Creek Alpine Resort. 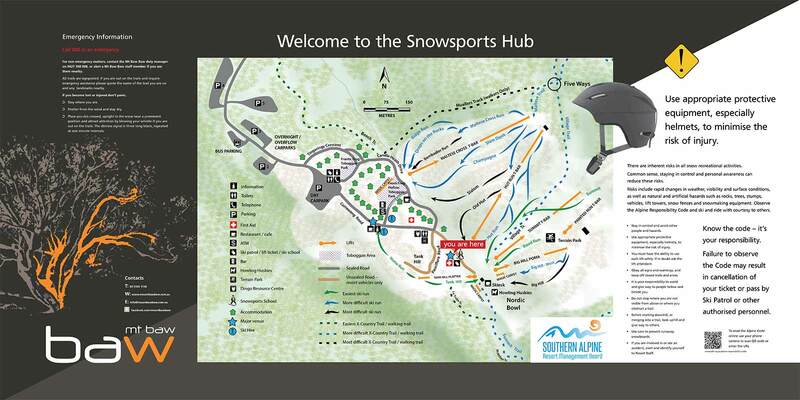 We also assist Mt Baw Baw Alpine Resort to address their visitor orientation requirements. In this we work alongside managers from the respective resort and park agencies who are responsible for contributing to the design process and thereafter implementing the on ground works schedules. 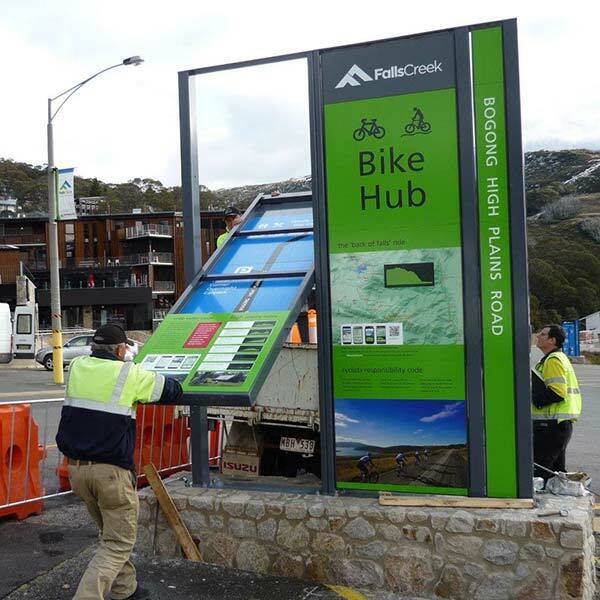 Some examples of the project works we helped develop for Falls Creek in concert with Geoff Sorensen (Falls Creek Alpine Resort) and the signage company Screenmakers are shown below. 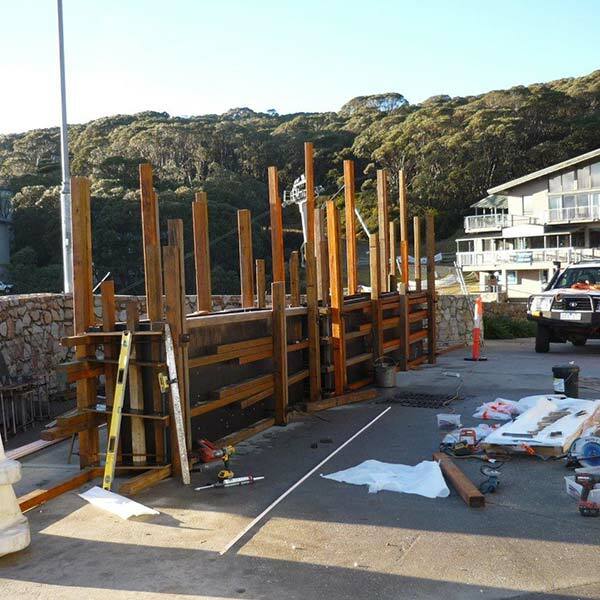 Major infrastructure works like this formwork for the Falls Creek Slalom Plaza information / bus shelter often have a small seasonal window open to them. An early May snowfall sets off the completed shelter with its green, summer seasonal information content still in place. 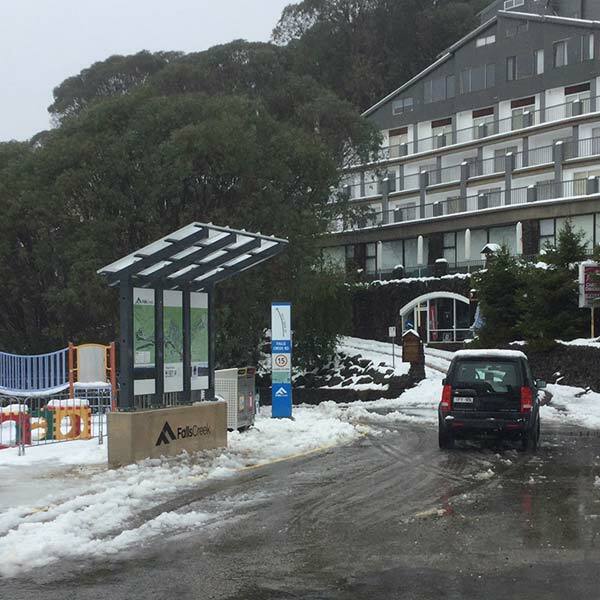 During winter the shelter provides a vital part of the internal village transport network. The changed panels highlight its function as a seasonal bus stop. The bus / information shelter at the Village Bowl shows how the unit is designed to be integrated into the new street signage ensemble also rolled out at this time in 2015/16. 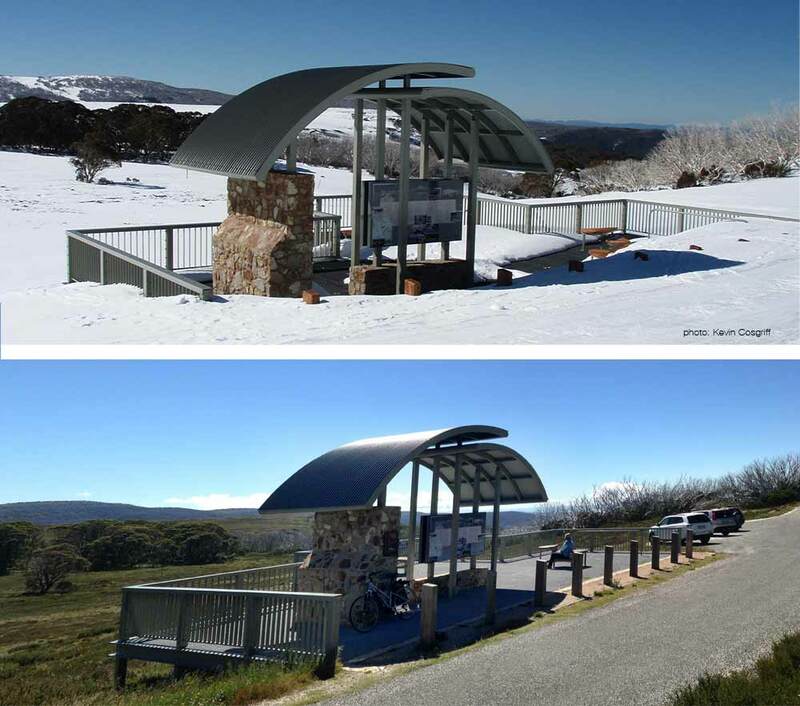 The challenge of creating infrastructure that works effectively even when the user viewing position varies by up to 800mm elevation across the summer/winter seasons is shown here. 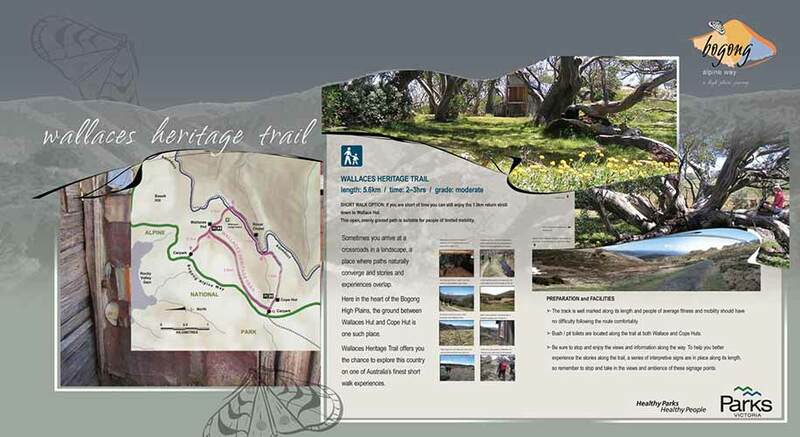 The utlity of the signage across the village is supported by the custom built Falls User Guide web app. This provides additonal content that would otherwise clutter up the signage designs. It also allows for multi lingual content delivery. 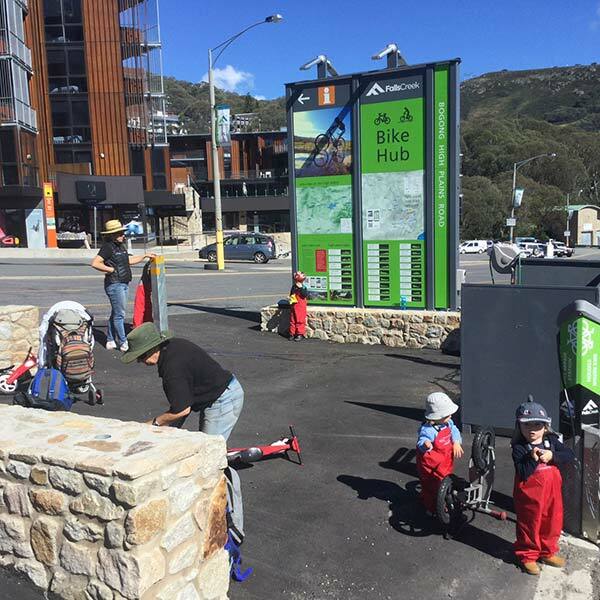 The bike hub venue in the village shows how the summer information content is geared specifically to its seasonal needs of catering for mountain bike users. 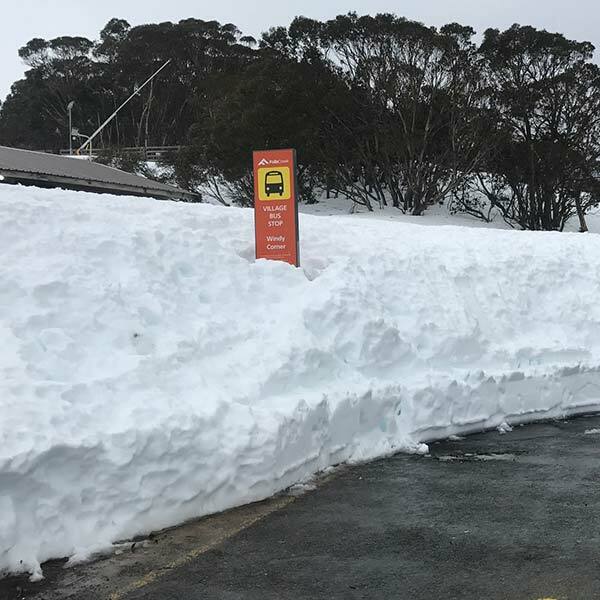 Thanks to an operational design solution conceived of by Geoff Sorensen to create a swing hinge for the 3m high signage units, the signage panels can be easily changed over from summer to winter modes of operation in late May. During winter the prime function of the road signs shifts is focussed on directing traffic flow around the village. 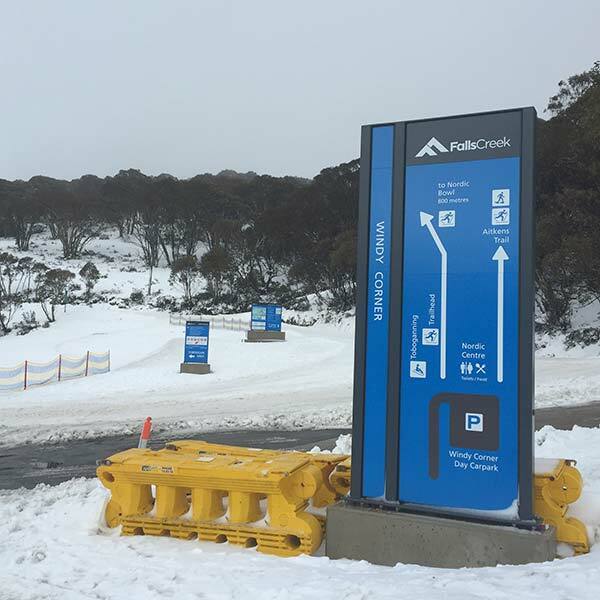 A major feature of the Falls Creek signage program was the design and installation of a new series of street signs to provide effective summer and winter directions around the village road network. 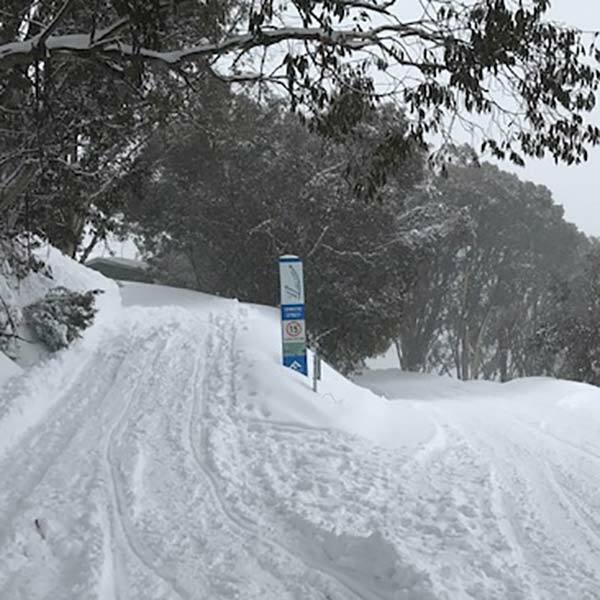 The positioning of the relevant content on the roadsigns has been carefully considered to ensure functionality is maintained even in heavy winter snow conditions. 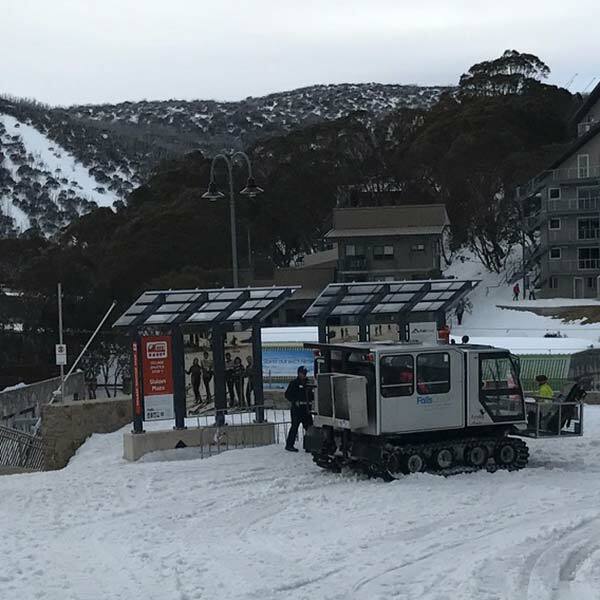 A feature of Falls Creek Alpine Resort operations is the way in which they switch between blue season (winter) and green season (summer) operating modes. 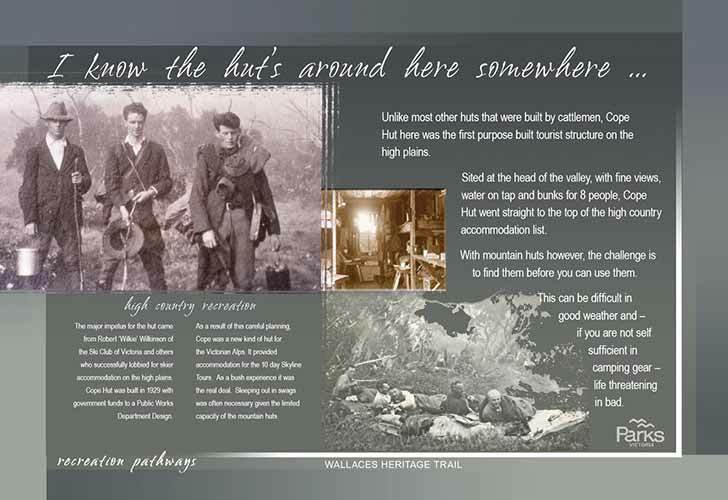 To support this we produced completely different sets of visitor orientation materials for each season. 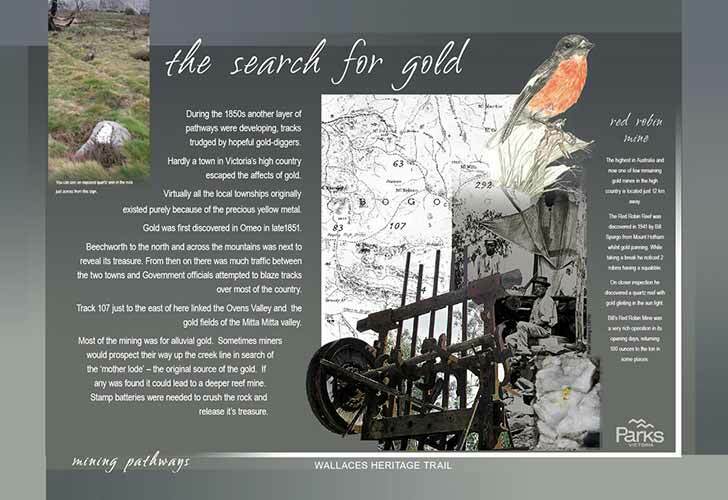 As in the case of the village maps shown here, these present only those amenities and facilities on offer in the village within the relevant seasonal setting. An example of how the sign ensemble changes from winter to summer modes of operations can be seen at the major trailhead entry to the cross country ski trail network at Windy Corner. 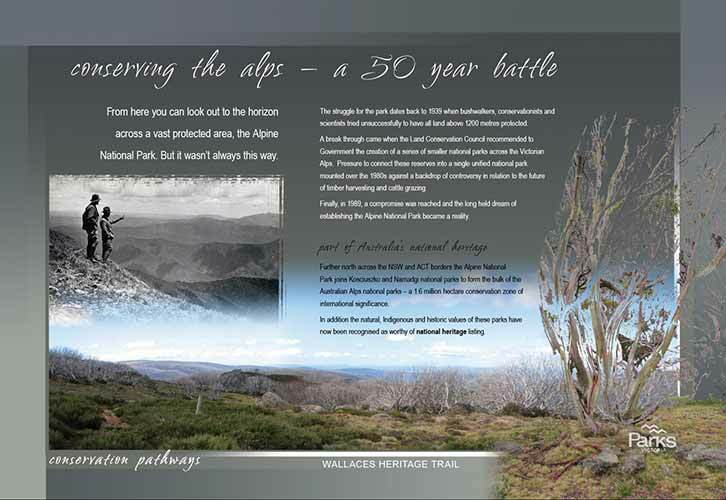 While the road across the Bogong High Plains is closed in winter, in summer it is a very popular visitor route providing access to a range of high plains experiences. 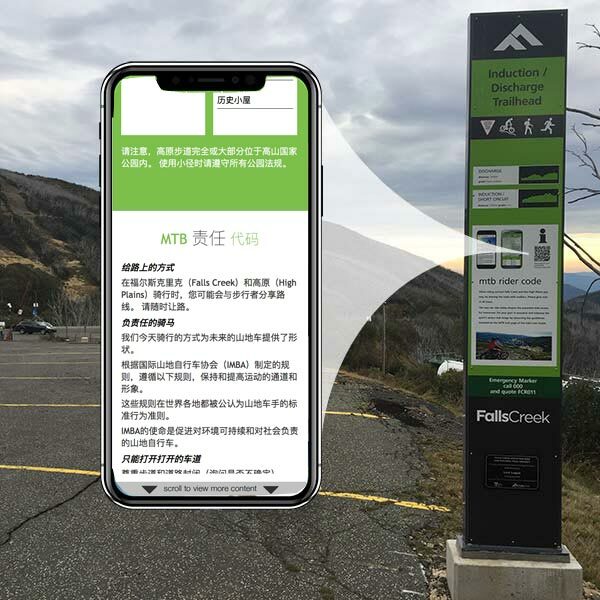 In support of only presenting such onsite information to visitors as is relevant to them at the time of their visit, the Falls User Guide web app that we produced for the resort in 2016 has two completely separate but mirrored component parts. 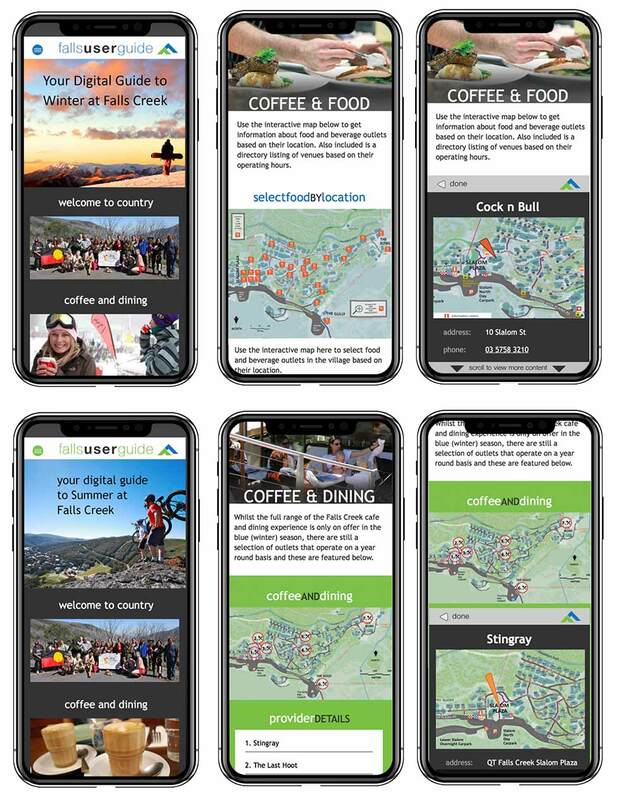 The example shown here for the coffee and food hotlinks shows the full variety of venues open to people to choose from in winter. Only a handful of these businesses however are open during the summer season. Rather than confronting the visitor with a reminder of how many food and beverage opportunities they are missing out on, the summer version of the web app has a completely different menu page. This presents the smaller, specific set of venues there for visitors to choose from. 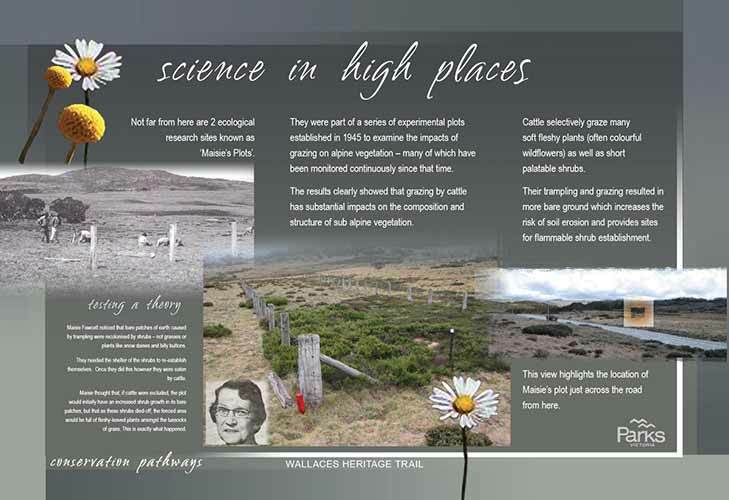 In 2010 as part of the sealing of the Bogong High Plains Road east across the High Plains we undertook a major landscape and interpretive planning and design project for Parks Victoria. This involved the upgrading of a series of roadside venues along the newly sealed road. 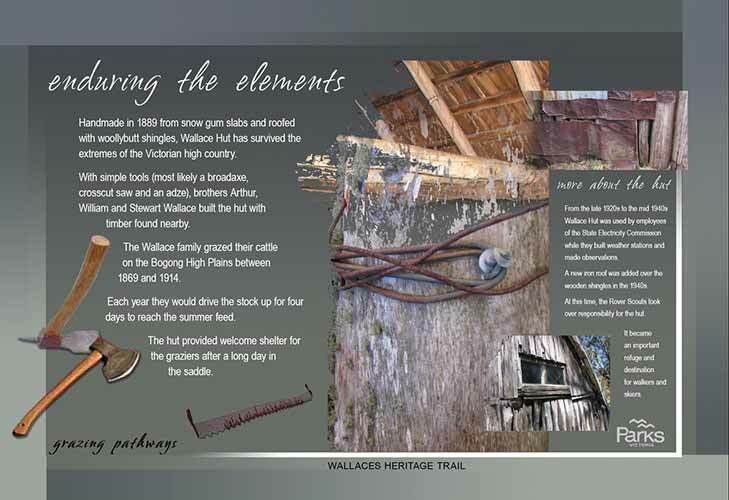 The premier location was the trailhead to the Wallaces Heritage Trail located some 10km by road east of Falls Creek Village. A feature of our work at this venue was the design of a new viewing platform with a custom shelter structure. This feature was specifically designed so as to break up the long corridor effect of the side roadway leading up to the start of the walk by creating a major visitor arrival node midway along its length. 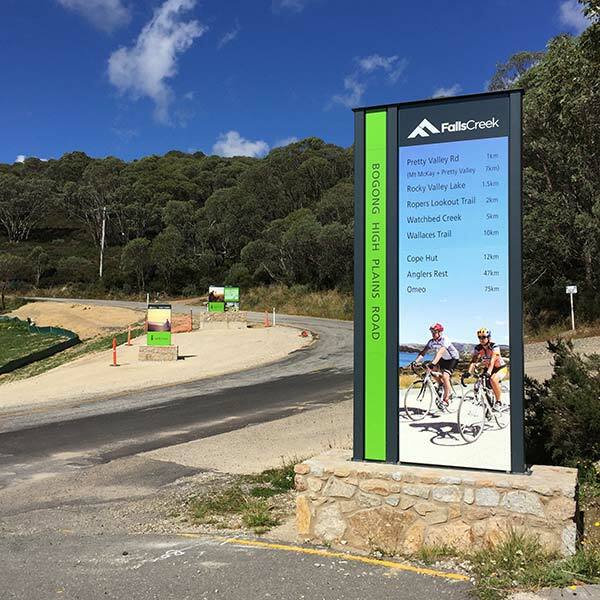 This work complements the signage installed along the heritage trail which we also designed. 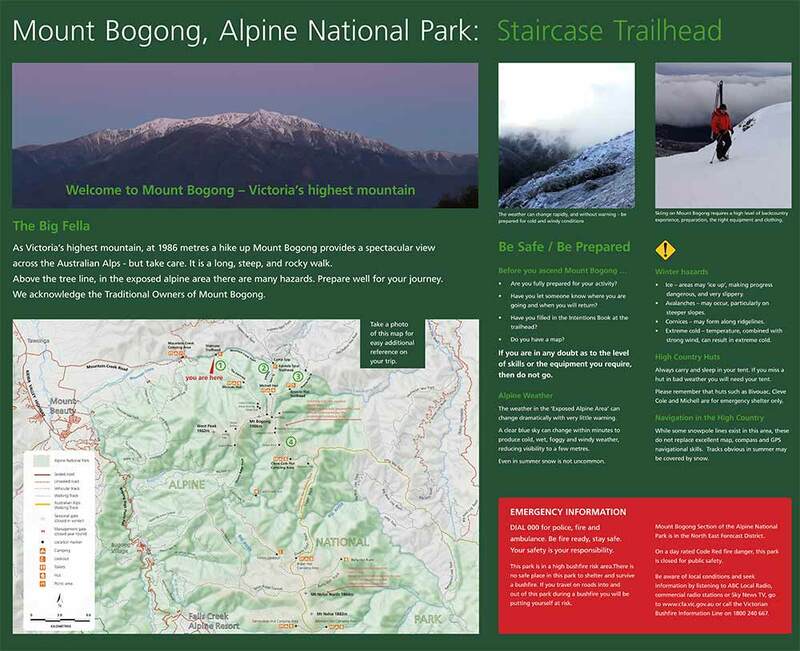 In 2017/18 we assisted Parks Victoria with the design of trailhead signage at the northern entry points to Mount Bogong. 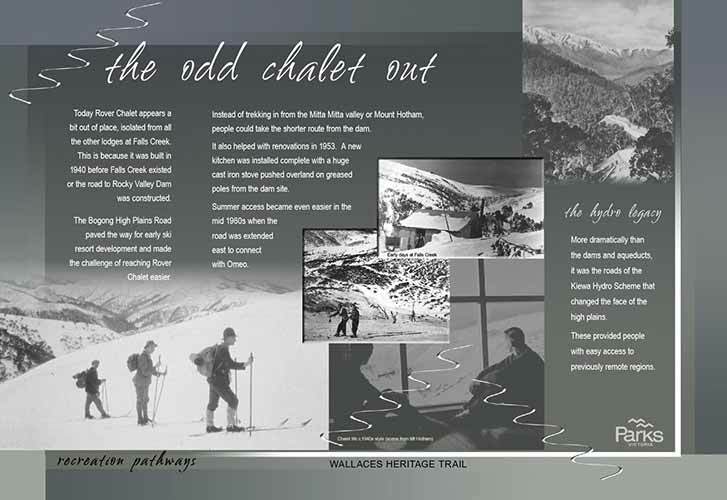 A major feature of this work was the design of a comprehensive trail map to highlight the exposed areas above the treeline of significant hazard to walkers and skiers. 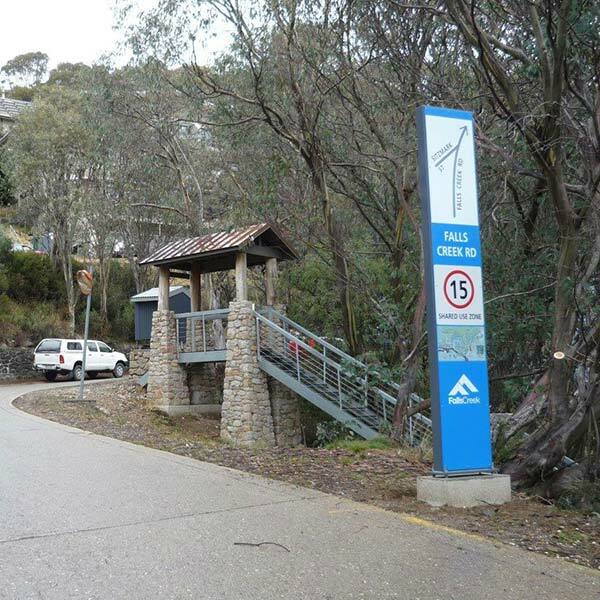 In 2012, we also assisted Parks Victoria with the design of visitor orientation signage for Mount Buffalo and Mount Hotham (below). 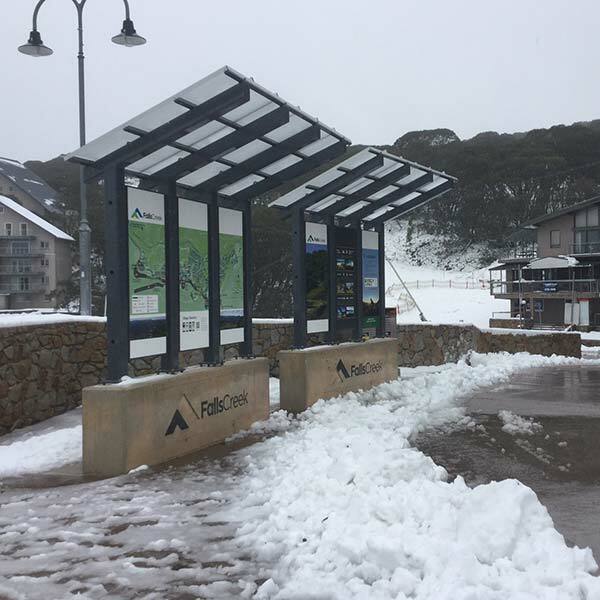 In 2017 we produced the draft signage plan for the Mt Baw Baw Alpine Resort located on the southern most edge of the Australian Alps. 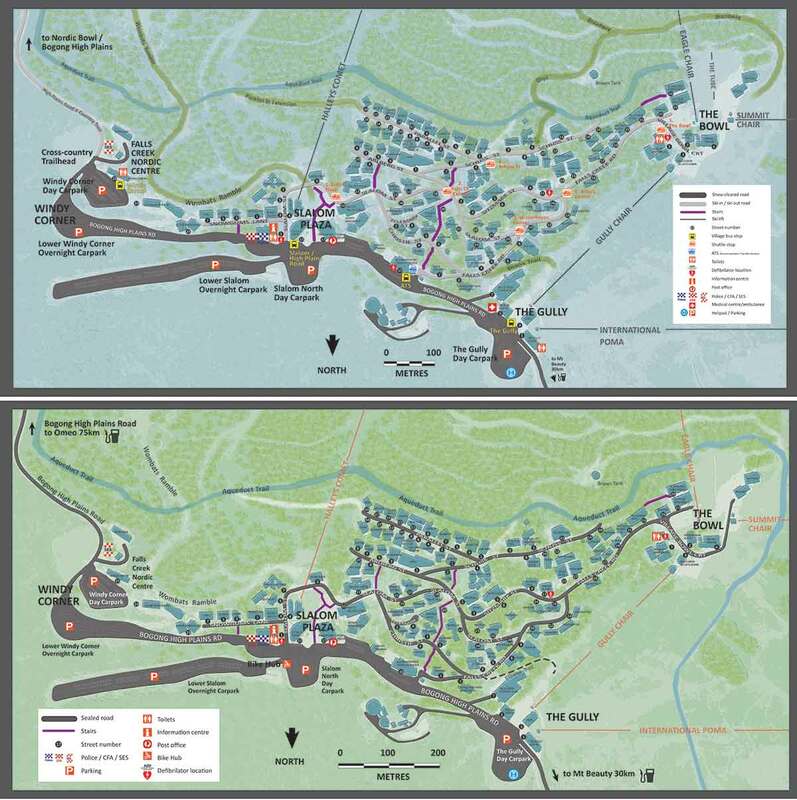 We reviewed and updated this plan in early 2018 prior to a roll out of resort orientation signage commencing in time for the 2018 ski season. 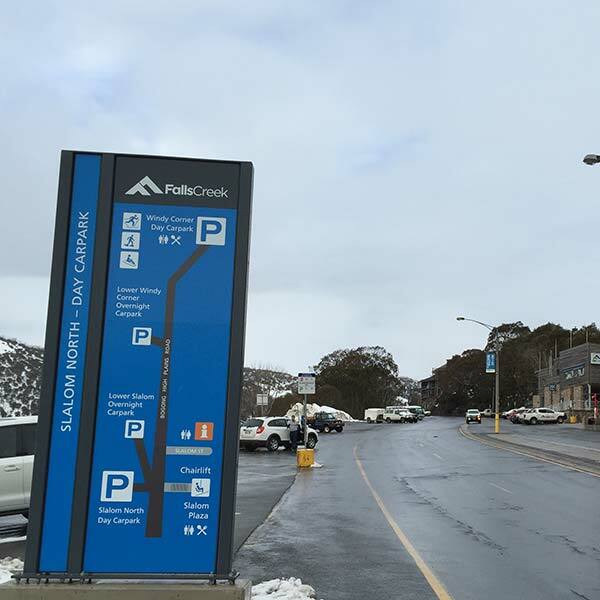 This work included the installation of major resort entry signage and roadside directional signage. 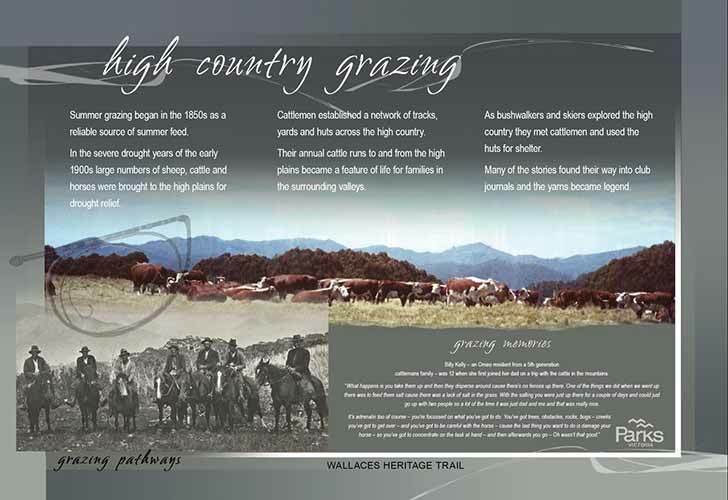 Visitor orientation panels were also produced. 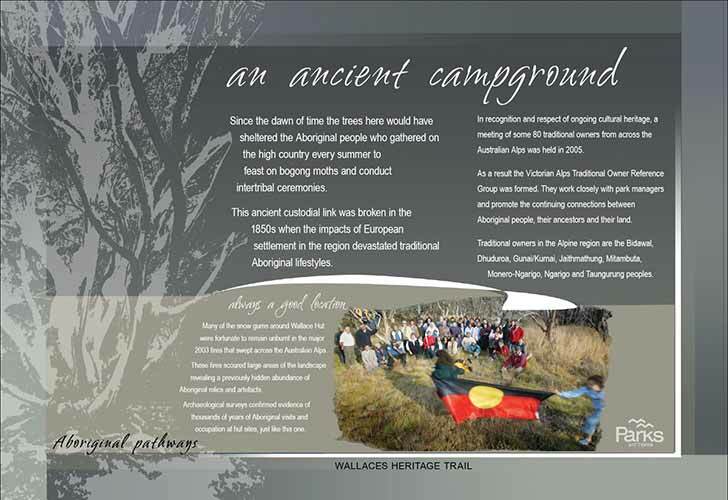 These feature the latest resort map we first created for Mt Baw Baw back in 2011.